How come I don't do ten places to eat pizza? Was there not enough places? I think it's super hard for some reasons because of lack of creativity and the ingredients of the dough are always being short changed. Dough is an essence of what makes pizza taste good. The flavors of the pizza and sauce/cheese base is quintessential with the toppings being the extra icing on top of that pie. Luckily for me since I was back writing a few places for this blog, Italian cuisine have seen a renaissance in this vast diverse region of the country. 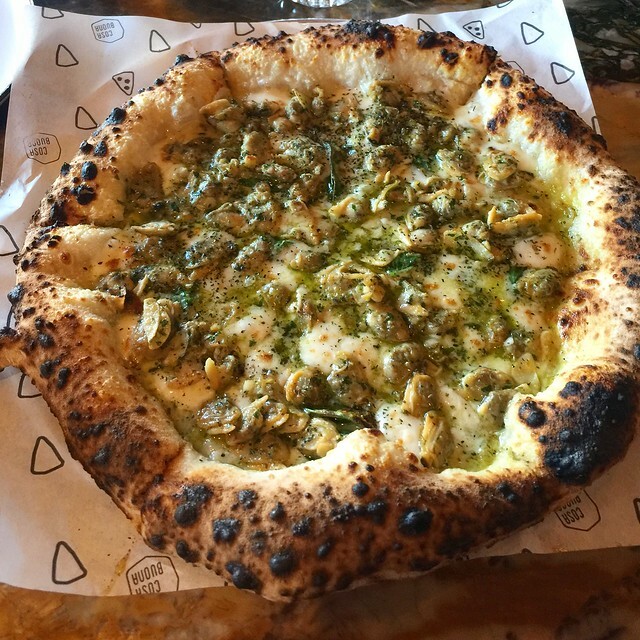 In the past, people don't associated LA or Orange County as Italian epic center, but a lot has changed as more and more transplant from other cities bring their roots here and other chefs trained in oversea have come back to share their love of a good pizza. 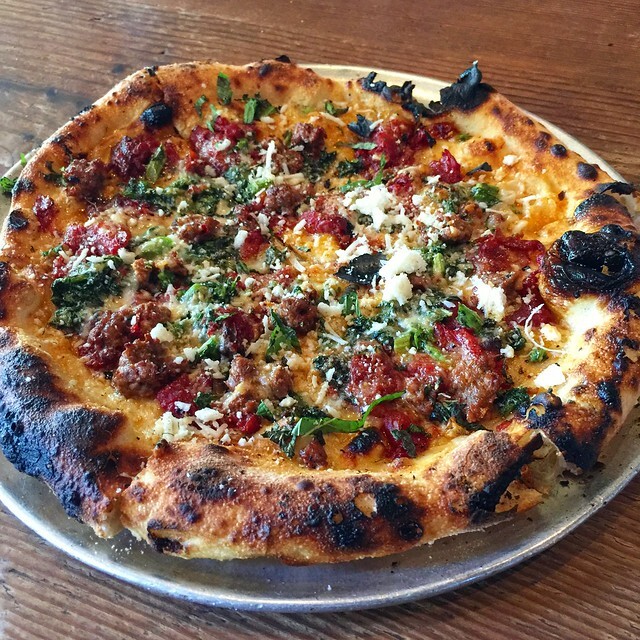 Ten places in Los Angeles for many people to visit for the some of the best pizza you'll experienced. Many people have shortchanged the idea in that a burnt on the crust is always bad. I think it add flavors to the component and a great look for outer edge. Gjelina is a uber chic hotspot in the burgeoning street of Abbot Kinney Blvd in Venice. The restaurant was ridiculous packed for weekend lunch and every day dinner. If there's a specialty, it gotta be their toasts for brunch. Don't sleep on their pizza though. They have some of the best pizza in town. Did we really have to go into on why this place is on the list? Very often or not, this place was considered to be the Crème de la Crème of all sit down restaurants in all of southland. Forget about getting a reservation for the weekend as you might need to book a month in advance. There are many reasons for the get up such as the pasta dish of Pici al Sugo di Agnello or the famed roasted bone marrow. The steaks are fine too. Bestia has everything Italian you want. 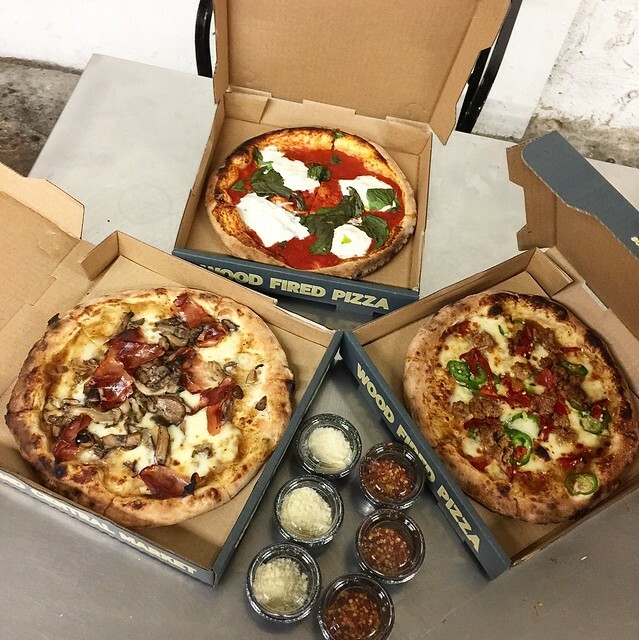 It's their burrata pizza selections that will get you to the door or out the door. Their pizza is a must and probably will make you order one to take out as well. 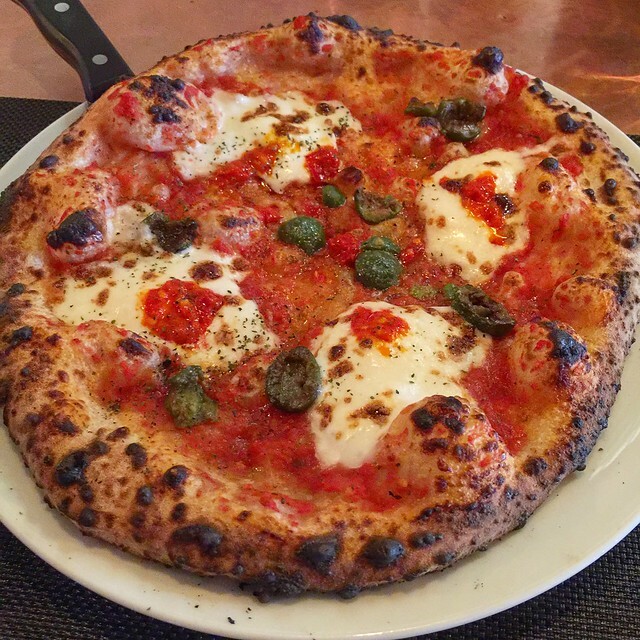 Go with the san marzano tomatoes, castelvetrano olives, oregano, fermented chilies variety of burrata pizza. You won't regret that. They made a quick epic return from the recent post. It goes without saying they have the best selection of unique toppings and hard to find ingredients on their pizza. Try out the Roman Gladiator pizza above and you won't regret it. For anyone who needs a refresher, please check out the review here to get an idea on what I would order at Jon and Vinny's. When I decided to restart my little blog again, one of the first destination I hit up based on recommendations of famous restaurant critics in town, Love and Salt was the choice. Give you a quick rundown in that it's on a revitalized main street of Manhattan Beach where busy high class residents are mostly congregated at. You probably can sneaked them some generic Italian cuisine and called it fine dining. This place however stood out from the rest and it's a godsend. 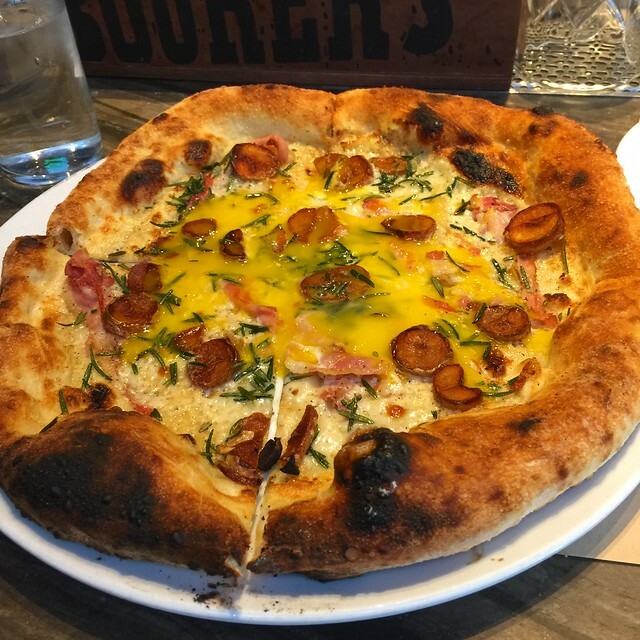 They have many classic dishes to try, but for pizza, you gotta go with Duck Egg Pie. Check my review of Love And Salt for details of other dishes to try. One of these days, I will get around to do a decent post on this place. It blows my mind that this place doesn't get the talk for pizza, but for the pastas. 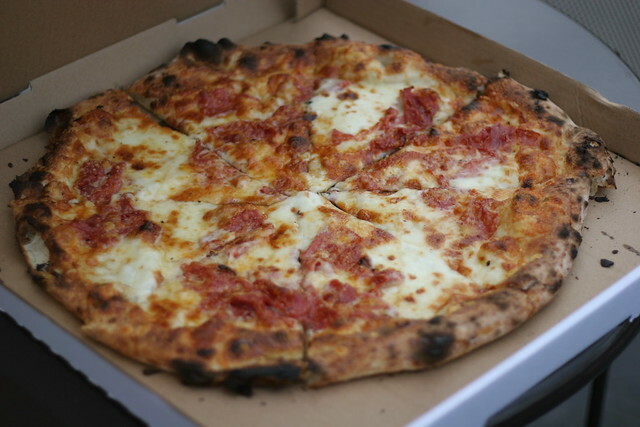 To give you a weird rundown, Cosa Buona replaces another pizza joint. Weirdly in that a lot of people do walked up to this place and thinking it's a casual take out like the former place. Alas, they found out it's a much elevated Italian place complete with other pasta dishes that are to die for. My first option was the pineapple pizza everyone was raving about on Yelp, but wound up having a much better bite with a white clam. Oh, noticed the black marks on the crust end? Yes, you know it's pretty when that happens. My only advice for the next pizza place.. take over a Thai restaurant. Will have no confusion unless it's serving Thai curry pizza. There are some options for great deep dish in this region finally. Lucky for some of us, there are transplants from the midwest that are showing us these stuffed pizza in a pan that will galvanized us into craziness with the topping between the crust and cover in cheese like an average pie. Having this creation bestowed upon us, I must admit it will set everyone back in the calories count for the next week for just one meal. 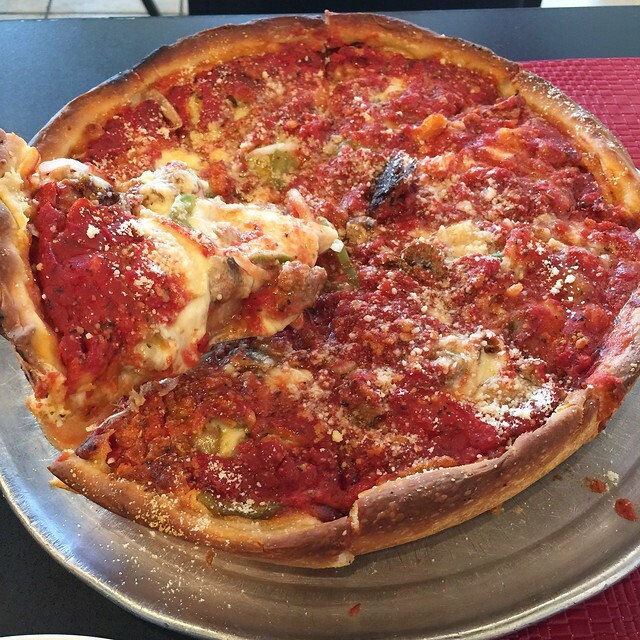 My favorite among all of the recent explosion of deep dish pizza comes in the courtesy of Tony's Little Italy Pizza, located in the far east region of the map. Closer to Riverside than to LA. Worth the trek as their crust was flaky like pie crust with deep sauce and cheese covering up the meaty components like a shepherd's pie. The best Chicago's style deep dish from a true Chicagoan. Recent discoveries let me to this take out window that serves a pizza that LA should call one of its own. It seemed our beloved city has taking a liking to spicy honey flavored pizza. There's one other place I know that would served such a type pizza, but you have to go to Orange county for this venture. Stick with Superfine Pizza . Two things you want to know. One, to get you excited, this place has the same masterminds behind the hit restaurants Rossoblu and Sotto. So you know they take Italian cuisine very seriously. Especially on how they treat the dough. Second, digital payment only. Meaning you are going to need the plastics. No paper currency accepted. It's worth getting that spicy honey pizza! 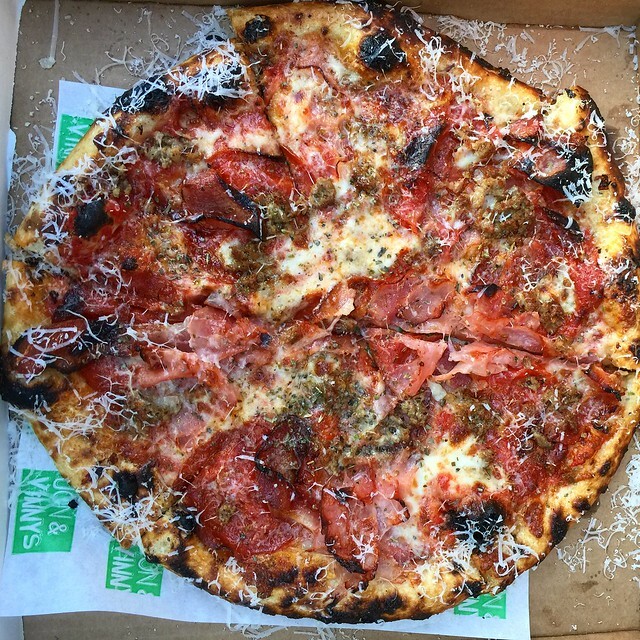 If there is a fast pizza place I would hit up, it would be Olio Wood Fire Pizzeria in the Grand Central market. The basic component of the pizza involves the ready to use dough and cheese ready to fire with the proteins you wanted to add. My favorite to order are the Wild Mushroom & Speck and the Margherita Plus. Those two are easy to order and way faster than your normal delivery places. Pro tip: Get the Agua Frescas next door to this food stall. I don't think I have stopped raving about this chain. Maybe I'll stop when the quality goes down, but it's worth noting in that this popular late night hangout for the local teens has bamboozled many in thinking it's a Chicago style deep dish place (read above for Tony's). I have gone in depth about what's Chicago about this pizza joint. I'm still love the twist in Chicago's Pizza With A Twist. The big twist was that it has Indian ingredients meshed with the traditional pizza. My verdict still stands as we speak. 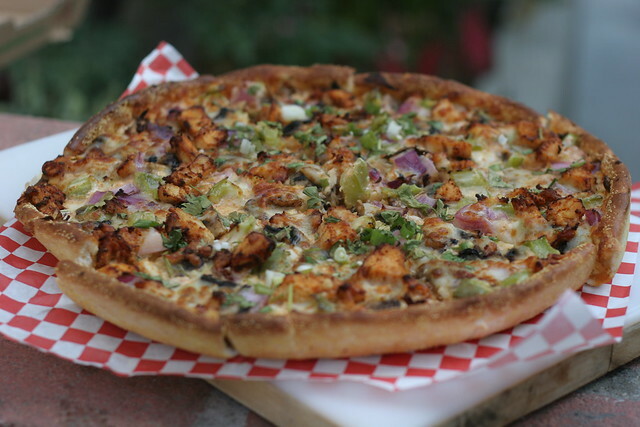 Check out the Chicken Tikka pizza. 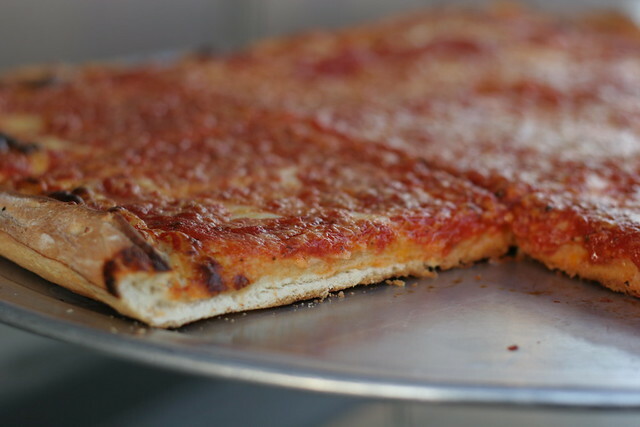 One of the hardest to find pizza in town for me was a grandma style pizza. It's Brooklyn style Sicilian that was promoted in downtown Long Beach that got me there. For this grandma style pizza, it's pretty much similar to deep dish without the stuffing. In this variation, as the name suggested it's Sicilian, meaning it's rectangular shaped. With the tomato sauce being promoted, it's lavished covered the cheese (not the other way around you're so accustomed to). You can only get this unique pizza here at Milana's New York Pizzeria.